Music completes the triad of universal languages, but it has its own special attributes not possessed by the other two. Mathematical at its base, music expresses thoughts and emotions with an almost divine power to touch the soul. Music is comparable to Latin in its potential to form the character of a student and define the culture of a school. Like Latin and mathematics, music is a core subject, required of students every year. Highlands Latin School employs a sequential K-12 program that instills the fundamentals of music and music theory through the training of the voice as a primary instrument. Mrs. Rhonda Hibdon introduces students to the elements of music through ear training, basic note reading, and the singing of simple, classic repertoire. The primary music class serves as a preparatory class for lower school choir and recorder ensemble. In recorder ensemble, students develop musicianship and apply their note reading skills through instrumental performance. The class provides an opportunity for students to experience differentiating pitch, dynamics, and musical texture through both individual and group performance. 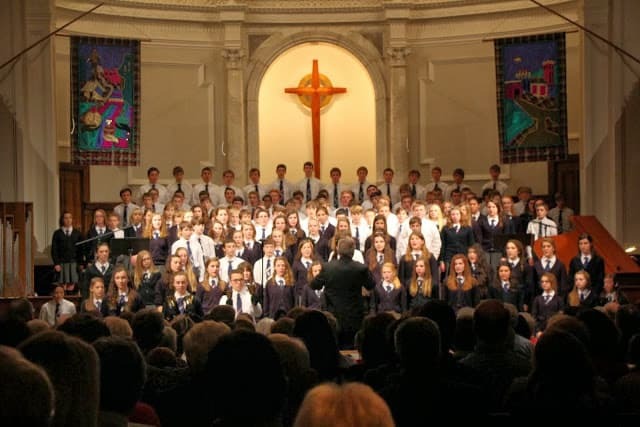 All grammar and upper school students sing in one of our Latin choirs, directed by Dr. Louie Bailey. In addition to age-appropriate techniques for training vocal production, Dr. Bailey employs solfege (do-re-mi…) and accompanying Kodaly hand signs to train the ear around musical intervals in preparation for reading and sight-singing.